In shallow, flowing, water small bore fluming is a cost effective alternative to over-pumping and has the added advantages of allowing passage for aquatic wildlife. Best flume results come with multiple 300mm twin wall pipes or 200mm semi rigid pump suction hose (widely available from pump hire companies), examples of both are on this web page. How does AquaDam fluming work? A "flume pipe sandwich" is created using a pair of AquaDams - a standard overdam plus a smaller underdam. 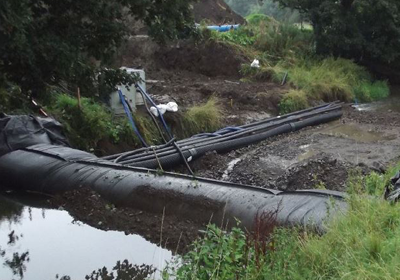 The purpose of the underdam is to stem the leakage around the flume pipes. Multiple smaller diameter flumes are preferrable to a single large bore flume pipe. Even relatively fast currents can be accommodated. The speed and flexibility of an AquaDam installation combined with a clear understanding of the environmental advantages of avoiding the introduction of foreign matter into a water course have delivered indirect cost saving such as expedited grant of environmental works permit. © 2019 all rights reserved. AquaDam is a registered European Trade Mark all rights reserved to AquaDam Europe Limited.